We here at Droid-Life are completely madly in love with making our phones look exactly how we want them to look. Isn’t that why we love Android to begin with? Choosing which Launcher is a big part of that. There are only a few big names that everyone is familiar with, but LauncherPro, and ADW stand on top. LauncherPro features seemingly endless customization features. But there are some misconceptions about ADW’s abilities as well. So I give you…WP7 for ADW Launcher and another nice surprise. There’s a lot of misconceptions about why ADW could not have the same look. While they do go about their docks differently, it doesn’t mean that its not possible. So with a bit elbow grease, a borrowed dock image and a can of monster, I set out to bring ADW users the same kind of love that LP was shown. Of course, I couldn’t just stop with the dock. I’ve also themed the included search widget, added a custom font in and also threw in some of the wallpapers that come with win 7 that I thought were suited for this. Enjoy the “trash can”! So Koveleski has graced us with an APK that will turn your ADW launcher into a beautiful wonderland. You will just install this with ADW already preinstalled. Then open up the themes feature for ADW, select the OMGWP7ONADW and have some fun! 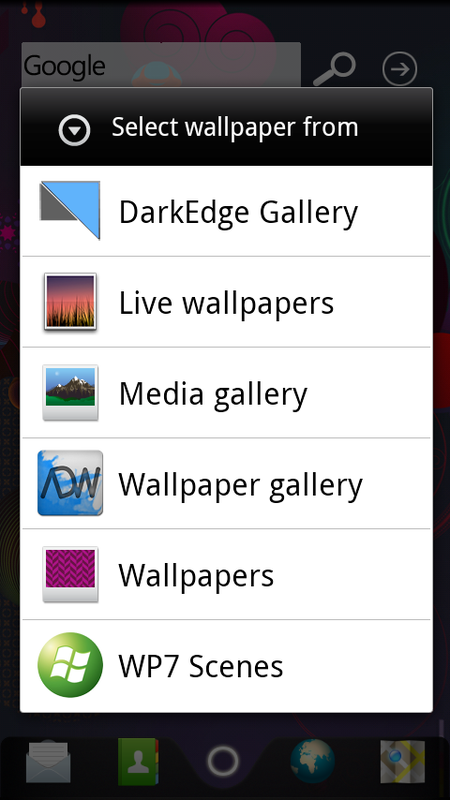 Step 1.Download ADW Theme APK Here. Step 2. Open the ADW settings and select the “OMGWP7ONADW” theme and enjoy! In addition we have some other GREAT NEWS – Koveleski will be having a weekly segment on setting up ADB and creating your very own ADW themes! How awesome is that? So check back soon and keep your ears and eyes open.